Would it be wrong to tie her to the chair? My brother told me he found her on a step stool the day after she came home from the hospital. Day before yesterday I walked into the kitchen to find her bent over with whisk and dustpan sweeping the mat in front of her kitchen sink. Today she’s lifting a large heavy plastic bin searching for 6 tiny screws she knows are “somewhere around here”. Though she is walking with a walker very slowly and eating pain pills and muscle relaxers like candy, the extent of her injury has not yet penetrated her brain. I prefer not to go over the obvious once I’ve mentioned it a time or two, letting reality do the talking, it’s much more convincing than I could ever be. The day after her little sweeping frenzy she was in such pain she swore she would not bend down to pick up a thousand dollar bill. Now I look over and tell her she probably shouldn’t pick up and move that bin and she says it’s not heavy and I say, oh, OK and she says, oh alright, I’ll leave it. I’m a terrible nurse/caretaker. I am impatient and my compassion is a small country with well defined borders. Her friends came over yesterday. One woman from Nicaragua, the other from Ecuador. They brought a plate of the most delectable looking (and tasting) home made Indian sweet pastries! Wish I knew what they were. I know this, they were scrumptious and odd. Sesame seeds, sweet potato, pistachios, walnuts, honey and who knows what else. They sat and watched Coming to America with Eddie Murphy and the Nicaraguan woman’s laughter was the best thing I’ve heard in a long time. Before they left they stood around my mom and she called for me to join them we all held hands and they prayed with their eyes closed while I watched their faces and listened. Though I am not a stranger to this landscape, I do not frequent the territory, I run from it as if my life depended on it. I always feel a perverse impulse to do something untoward. Been there done that ~ two years. I thought I would lose whatever I had left of my mind. I didn't have any of pals bring a smile and food! love the ~ laughter being the best thing you've hard in a long time. I always want to do something untoward too, when prayers are being said, even by the most truly devoted. It's the evil imp in me and I don't have much patience as a caretaker either, which is odd in that I've spent my life being one. Well, maybe you're storing up gold and rubies in heaven. Either that or you're just doing the right thing which is sometimes all we can do. A friend brought us some candy from Ecuador this winter. It had no sweet potato. white, sort of hard, nuts. strangely addictive. we were going to save it to share with the family on Christmas but I think we ate most of it before that. Hand on to your mind! Sometimes those pain pills do too much disguising for a person's own good. Carolyn, laughter like this woman's is a balm to my soul. It was so deep and joyous,infectious. Ms Moon, It's a terrible thing this impulse towards untowardness. I hope I lose control some day and let er rip! I think it would be good for me. and if there is some storage for good deeds up in heaven, I'm putting in my request here and now for peaches and foot rubs. AND you dear heart, are one of my role model caretakers. you do it right. 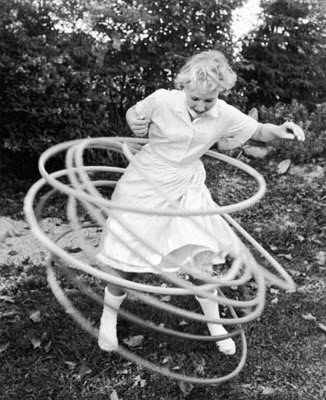 Elizabeth, the hula hoop picture is so perfect for this though I know it takes a sort of twisted road to see it. Thank you for seeing it. Kristin, since I'm here, my sweet tooth is talking. Sweets from Ecuador to Bombay are a ok.
Angella, there you go. Seeing the best in all of us. Seeing deeply into all of us. I am humbled. Thank you.